One year ago, in June 2017, we wrote "Why The (Collapsing) Global Credit Impulse Is All That Matters" in which we explained that among the relentless barrage of economic data, the only indicator that truly matters for global macro was how much credit China - which has been responsible for the bulk of global debt creation since the financial crisis - is unleashing upon the world at any given moment: the so-called Chinese credit impulse. The incredibly tight link between the credit impulse and China’s growth cycle, emerging markets (EMs) exports, global growth and commodity prices meant that it would have accurately predicted the direction of almost all other global macro variables that mattered, with about six months’ lead time. China’s tightening has not had a material impact on the growth cycle either in China or globally, even though its credit impulse began to weaken about 24 months ago. As deleveraging and adjustment headwinds recede, the recoveries in domestic demand in both DMs and EMs have emerged as additional global growth engines. 1) The pace of tightening is gradual and flexible in this cycle: Over the past 24 months, tightening in China has been slower than in 2013-15, and the pace of future tightening isn’t on auto-pilot. Policy flexibility is apparent in the recent cuts to reserve requirement ratios and the extended timeframe for implementing tighter regulations. What’s more, the bulk of the tightening cycle may well be behind us. 2) Tightening in China is counter-cyclical this time: As policy-makers in a highly levered economy attempt to tighten and slow credit growth, domestic demand should weaken. In China’s case, this usually raises worries of a hard landing, as it did in 2013-15 when policy-makers tightened pro-cyclically against a backdrop of weak growth in exports. However, with strong global demand now buoying exports, today’s tightening is counter-cyclical. While policy-makers continue to pare back stimulus in the infrastructure and real estate sectors, net exports, private investment and consumption are providing offsets, helping to support overall growth momentum. Indeed, on Morgan Stanley estimates, from 2016 to 2018, the contribution of net exports to GDP growth has swung by 120bp (from being a drag to a boost), offsetting the decline in contribution from investment. Rising protectionist risks are an additional investor concern, given the importance of external demand to China’s outlook. Our long-standing view has been that the US and China will eventually negotiate a deal that brings about a gradual and non-disruptive adjustment in their trade relationship. This should limit the impact of trade frictions on economic growth. Furthermore, we expect the global trade cycle to stay buoyant, sustained by strong global demand. Also supportive is the prospect of fiscal expansion in the US when the economy is near full employment, which will keep non-oil import growth relatively high and likely widen the non-oil trade deficit. It should therefore come as no surprise that our chief China economist, Robin Xing, projects only a moderate slowdown in China’s growth, to 6.5%Y, in 2018. Hence China will still contribute 1.2 percentage points to global GDP growth in 2018, close to its share in 2017. With growth holding up in DM and accelerating in EM ex China, we expect global growth to remain steady at around 3.8%Y over the next four quarters. Nonetheless, some risks bear watching. We have been focused on financial stability in the US and tightening in China. As we argue here, we are relatively less concerned about China’s tightening. So if you had to pick just one factor to worry about, your choice should probably be US financial stability risks. While we appreciate Morgan Stanley's attempt at overhauling Austrian economics, we disagree with the conclusions, because when push comes to shove, it's still all about credit creation, and - as we showed recently - China's credit impulse works with a very distinct lag. 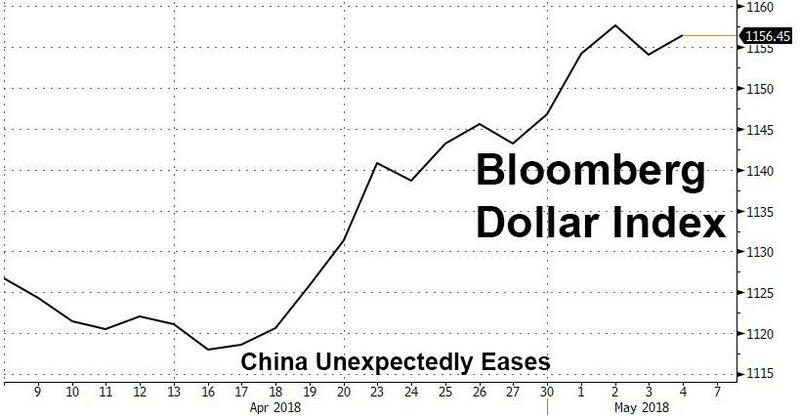 As for the best argument why Morgan Stanley is wrong, we will defer to what BofA's Michael Hartnett also just wrote this morning, noting that "global central banks just eased led by the PBoC, reminding everyone that on April 17th China surprised with an easing of monetary policy" which incidentally has been the trigger for the most important move of the past month: the relentless US dollar strength. In other words, just as the global slowdown from the ongoing Chinese credit impulse is finally being felt, China does what it has done every time global growth hit a brick wall: it has resumed easing in hopes of sending the country's Credit impulse back into positive territory, re-stimulating global growth in the process. 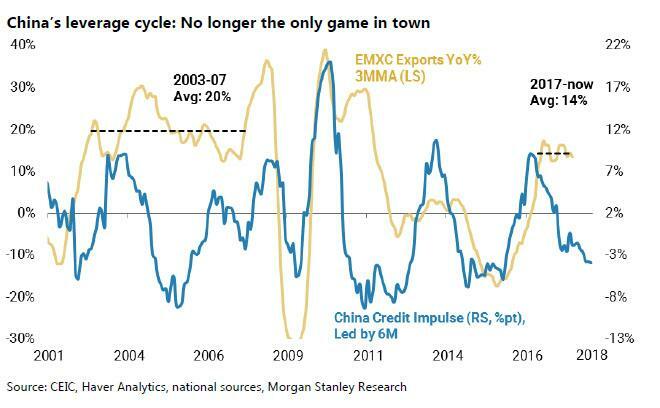 So no, Morgan Stanley, the Chinese credit impulse link is most certainly not broken, and as for your advice to "not fear China's policy tightening", that may have been warranted 6 months ago, however now that China is once again easing, you may want to reassess.